Are we the only family that has Macaroni and Cheese on every holiday table? 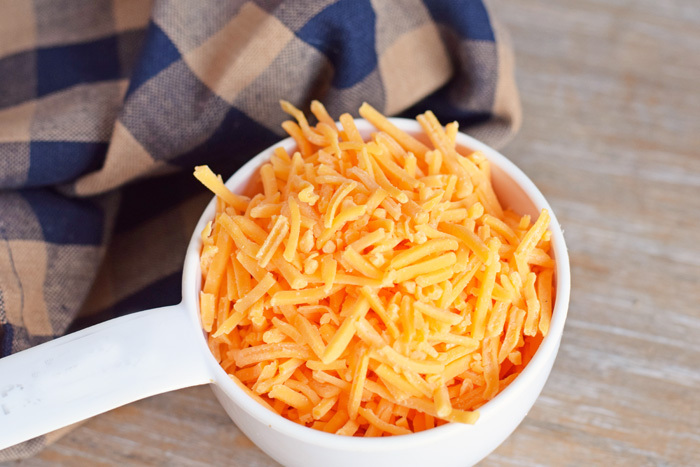 When I started dating my husband, I noticed that his family had Macaroni and Cheese as a side dish throughout the holidays, and it is a tradition that we’ve kept throughout the years. Even though my youngest kids are only four, they have come to expect Macaroni and Cheese at the table. But I’m going to let you in on a little secret. I actually am not the biggest fan of regular ol’ mac and cheese. Regular mac and cheese is too, well, cheesy. And mac and cheese from a box? I’ll definitely leave that for the kids. 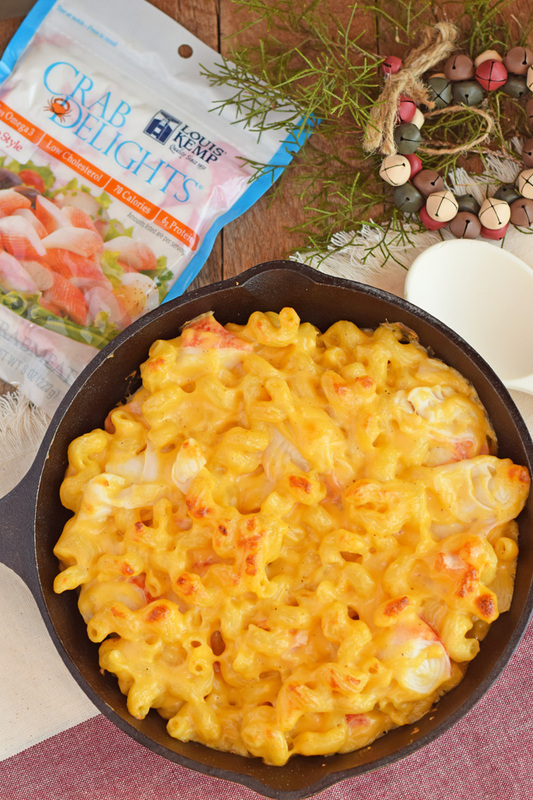 But make mac and cheese from scratch, then add a flavorful element like seafood, and I’ll eat this Seafood Baked Macaroni and Cheese for all the holidays! 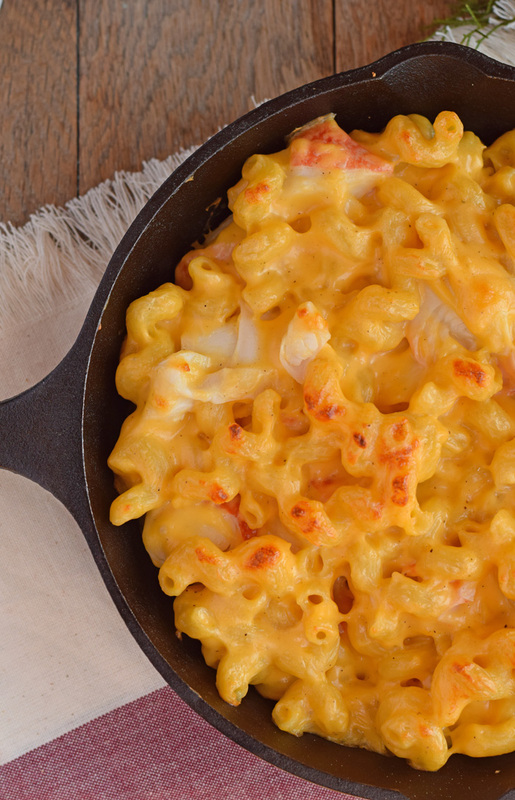 Not only is Seafood Baked Macaroni and Cheese a tasty way to create a more “adult” version of mac and cheese, but it is a great way to get kids to eat seafood. You know how some recipes boast about sneaking in veggies? 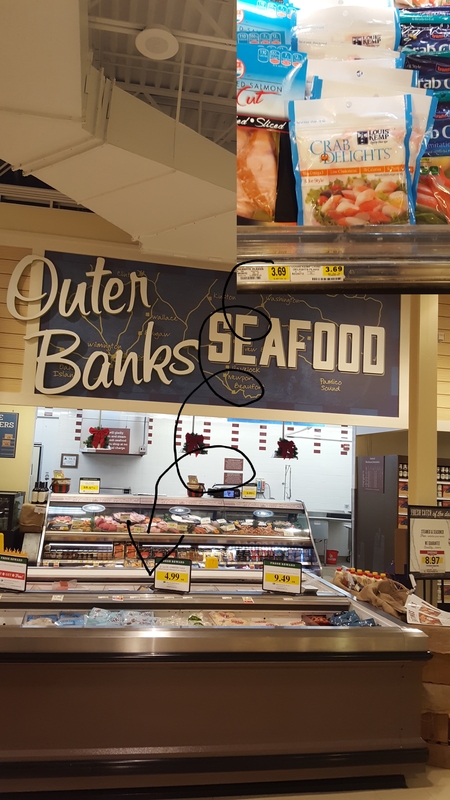 Well, this one sneaks in seafood! Following the directions on the pasta package, cook the (2) cups of Corkscrew noodles, adding Pink Himalayan Sea Salt to the water. While this cooks, preheat the oven to 350. In a large pan (the pan should be large enough to drop all the pasta and mix it in after it is finished cooking), melt the butter. Add the flour and stir for about 2 minutes. Add the milk and salt and pepper as desired. Whisk until the mixture thickens. It should be thick and not runny. Add the cheese and stir until the cheese is melted. Remove from heat. Pour the finished pasta (after liquid is drained) into the cheese. Add the package of Louis Kemp® Crab Delights® Flake Style. Stir so that the mixture is thoroughly combined. Generously spray a 9×9 baking dish with non-stick spray OR use a medium sized cast iron skillet. 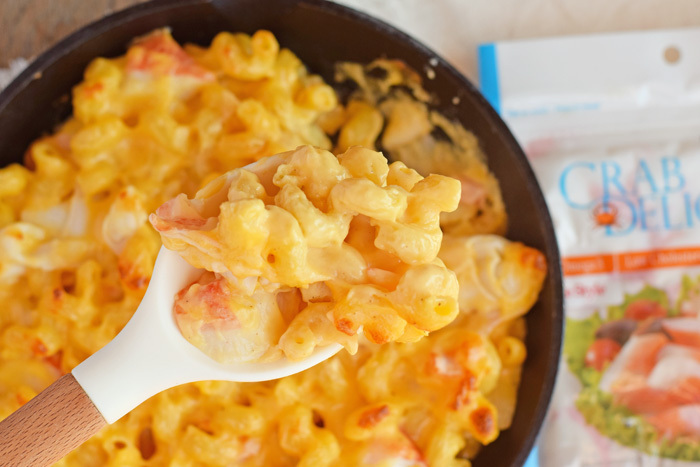 Spoon the mac and cheese mixture into the dish or skillet. Bake for 20 minutes. This is one holiday side dish that I am excited to add to the plate! In addition to being gluten-free and a good source of protein, Crab Delights are made with premium Wild Alaskan Pollock fillets. I found mine at a local Lowe’s Foods in the refrigerated seafood section. 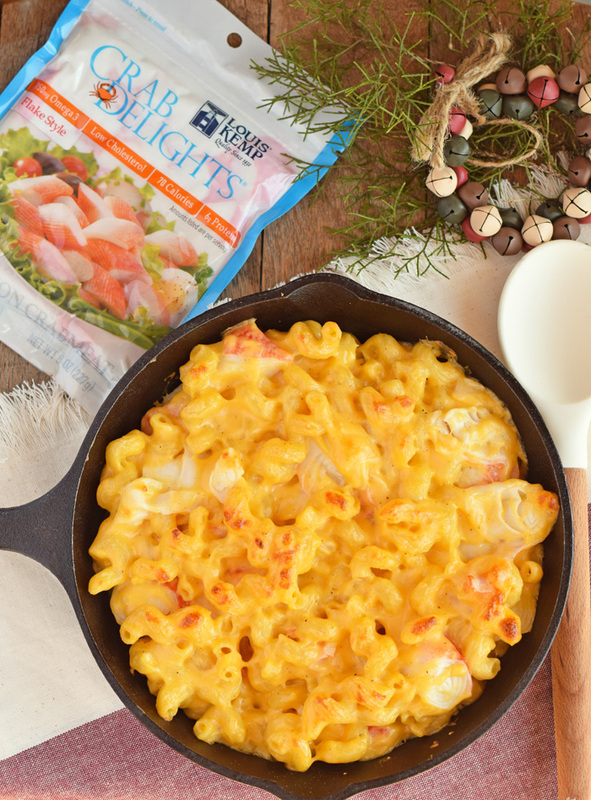 Try Louis Kemp® Crab Delights® with this $1.oo OFF coupon! I love crab meat, so this looks amazing to me! I will have to try it! I am a sucker for a good, homemade mac & cheese. I love how people get creative with the ingredients and you definitely went all out with quality ingredients. I am suddenly craving dinner! Crab meat is always a hit in our household but I’m always looking for new ways to incorporate it into our recipes. 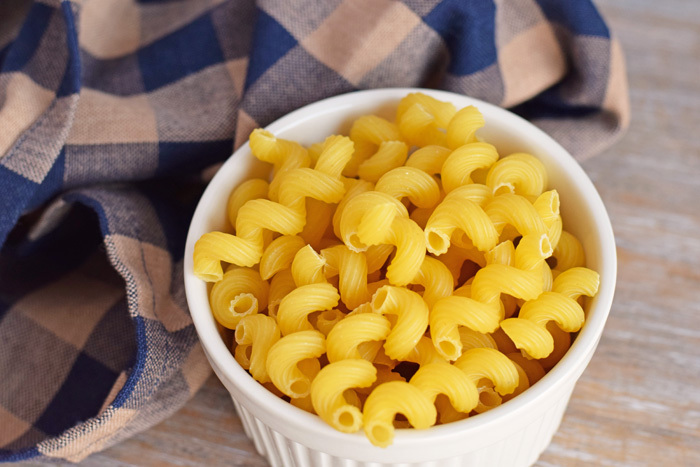 We all love mac and cheese so this is a recipe we can’t wait to try. I love that there’s even a coupon to save some money! Great recipe. I am going to have to make this for my son. He loves crab and we do not have it often. This would be quite a treat for him. Thanks for the yummy idea. Wow this looks so good! I am all about switching it up with new and exciting stuff and this is that for sure! My family would enjoy this one and I am now craving it big time. I have to try this one soon ,thanks for sharing! Confession: I’ve never had seafood Mac before! This recipe looks easy to follow and very delicious. Although I’m vegan, I know my friends and family would love this dish! 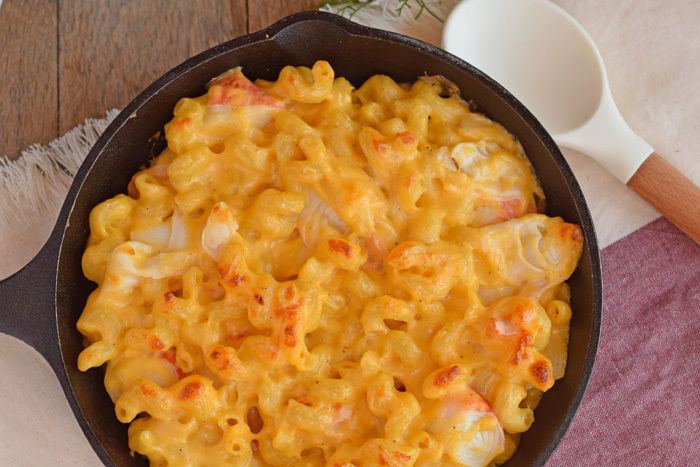 Wow – SEAFOOD BAKED MACARONI AND CHEESE – I would have never thought of this and it sounds, plus looks good – I was a professional cook in the past and have never made Mac & Cheese from scratch! Coincidentally made mac&cheese today, but hubby said it could have been better…haha! I just used the box-ready one. I will definitely try your recipe soon, I remember lobsters are a good choice but the surimi you used looks good in it too. Thanks for sharing. 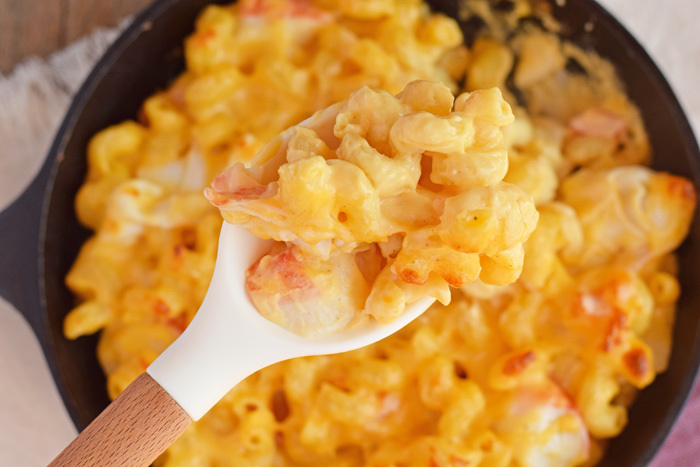 Baked macaroni and cheese isn’t really my favorite when it comes to pasta, when you add seafood into the mix of flavor, I’d sign up. I’m especially intrigued with the crab delights. $1 off coupon is a good deal.